Halloween — but not actual Halloween, so pretty much a grey zone for those who embrace festive costumes. I opted for regular attire but a solid third of the audience appeared to be dressed up, which created a great atmosphere right off the bat. I believe someone even pulled off sparkly galaxy-themed face paint à la The Kid album cover, which was super clever and may end up an iconic costume because this album is nothing short of spectacular. familiarity and straddled the line between dreamy and haunting. Next up, Rêves sonores performed beautiful and sophisticated cinematic ambient scores alongside complementary live visuals by Lilith. Despite its minimalism, their set achieved an immersive fullness and pulled my mental state into a pleasant fog. After Rêves sonores cleared the stag,e all that remained on stage was a wall of hardware that would give even the most experienced synth master sweaty palms. Kaitlyn Aurelia Smith’s setup is positioned on stage at a 90 degree angle, giving the audience a profile view of both Smith and her Buchla, which acts as a harmonious extension of her body. After humbly addressing the crowd, she was busy for the duration of her set as both hands performed a perfectly choreographed routine of patches, dials, buttons and keys while she sang into a headset microphone. The continuous motion is mesmerizing, like watching a cross between an ASMR video and a familiar waltz performed by longtime partners. Her vocals were heavily processed, pitch-shifted and multiplied to create a organ-esque effect, yet they folded seamlessly into the pulses and rhythms of her modular sounds. 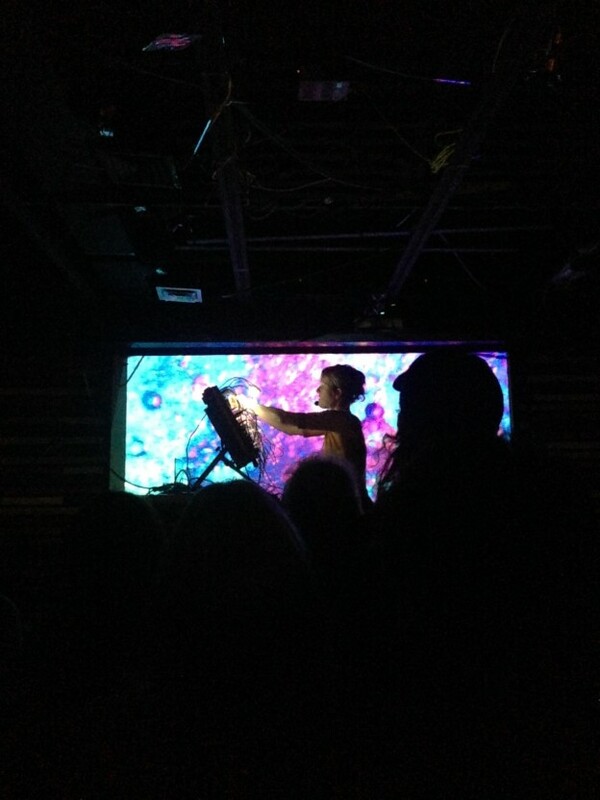 The visuals evolving on the screen behind her complemented the textures of music perfectly: brightly coloured bubbles and liquefying shapes matched the momentum of Smith’s sonic collage. chirps. Some moments induced a frozen trance while others led to involuntary sways from the crowd. 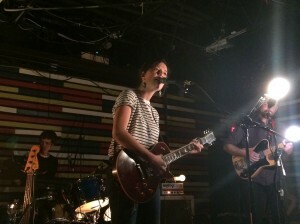 This performance demonstrated by far the most accessible of Smith’s repertoire, including dancier songs like “An Intention” and “Until I Remember.” Playful and unpretentious, Kaitlyn Aurelia Smith had a great energy and generous stage presence while taking the audience through a narrative experience like a safari through the human condition. This entry was posted in Reviews and tagged Bar Le Ritz PDB, hush pup, julia dyck, kaitlyn aurelia smith, reves sonores on November 6, 2017 by CKUT Music Coordinator. I couldn’t have picked a better way to celebrate America’s birthday. Kicking things off was Cende: simple, no-nonsense pop music played at a deafaning volume. Bouyed by their youthful energy and unpolished style, they ripped through a short set of formulaic yet enjoyable tunes. Following up, Japanese Breakfast slowed it down a notch with their slinky psych jams, tasteful bass riffs and shiny synth bouncing around underneath the ever-yearning lead vocals. When the hour was upon us, the chorus of ‘Life is a Highway’ rattled the Ritz soundsystem as Alex and his band rolled onstage. The music hit fast and hard, coursing through the audience and uniting the room within moments with an impressive sense of command, especially for such a relatively young group. The majority of the set was dedicated to his latest album Rocket, including the early standout track ‘Bobby’ and its welcome addition of fiddle to the band’s instrumentation. Though much gentler on the album, the live addition of a stomping drumbeat allowed the song to hit even harder than I thought possible, leaving the crowd torn between head-bobbing and slow-dancing. The songs are chunky and essential, like semi-polished stones, always build around the core of Alex’s raw voice. He sings mostly through clenched teeth, every measured note spat out, hints of the reserved energy that’s being held back. Only once did the dam breach, during an incredible rendition of ‘Brick’ — an explosive track in which he suddenely erupts in a scream as the guitars howl and rage only to drop away after a minute, giving way to the next piano-driven ballad. Being an avid listener for years and having followed the group for some time, I can vouch that the presence of 2017 (Sandy) Alex G is immediately undeniable. The band is at its most fluid, less buttoned-down than ever, and with a masterful command of Alex’s expansive discography. They closed out the set by spending near half an hour just taking requests from the audience, not once balking at a buried gem from the depths of his Bandcamp but rather dropping into it confidently at a moment’s notice. The generosity of this final act may have dragged on too long for those less invested in the music, but for the fans it was glorious. This entry was posted in Reviews and tagged (Sandy) Alex G, Bar Le Ritz PDB, cende, japanese breakfast on July 13, 2017 by CKUT Music Coordinator. Concert Review: The Luyas album launch @ Bar Le Ritz P.D.B. Montreal has a long and storied heritage of indie rock that skews towards the lush and orchestral and as far as staples of this scene go, the Luyas are among the finest. The launch of their latest LP, Human Voicing, was a testament to this fact. The band, comprised of Jessie Stein, Stephen Schneider, Pietro Amato and Mike Feuerstack have spent a decade polishing their sprawling psych-pop aesthetic. The bill was rounded out by openers Opale and Fleece, both proving to be loyal disciples of the headliner’s refined sound. The Luyas’s set began on an immediately tender note with the song “Fed To The Lions.” A plodding beat propped up gorgeous swells of harmony, highlighted by the delicate vocals skipping through. The crowd was rapt despite the fact that the set was almost exclusively new material; it was striking how these ambitious tracks, sonic monuments to mind and heart, still managed to feel warm and familiar to the ears of the audience. The band’s playful nature was evident: although their songs are dense and complex, they’re fun, too. Throughout the show, I couldn’t keep a wide grin off my face. Midway through, the band reached a shimmering peak with the gorgeous “Dream Of Love,” dedicated to a friend in the audience. Horns, synth, and guitar coalesced atop a driving rhythm, but never in a way that felt too epic or overdone. This is a defining feature of the Luyas’s music: no matter how the music towers, shifting layers piling up to the ceiling, Jessie’s voice always manages to keep it achingly intimate, close, urgent. Even as the keys burst out the gate and threatened to break loose on crowd-pleasing closer “Too Beautiful To Work,” the reins were held close and we were masterfully guided home. This entry was posted in Reviews and tagged Bar Le Ritz PDB, fleece, opale, the luyas on March 15, 2017 by CKUT Music Coordinator. Saturday Night is the first solo album by Ought singer/guitarist and former CKUT music librarian Tim Darcy. Performing under his own name, Darcy abandons his speak-singing techniques and develops a smooth and mesmerizing vocal energy. Accompanied by idiosyncratic instrumentals and delivered by means of beautifully delicate lyrics, Darcy’s vocals on Saturday Night spellbind the listener and give the album its ethereal feel. The album’s opening track, “Tall Glass of Water,” is an upbeat tune displaying energy reminiscent of Lou Reed’s Transformer. However, it is with the album’s second track, “Joan Pt 1, 2,” that Darcy begins to shed his Ought aesthetic and reveal his individual sound. After two minutes, the song’s initial character fades and a new one – the cryptic crooner – is unleashed. From this point onwards, Darcy’s enigmatic vocals stay at the core of Saturday Night’s musical exploration. On “Still Waking Up,” Darcy succumbs to his inner love-sick crooner. In doing so, he fuses a Roy Orbison-esque southern charisma with a more whimsical cadence, fomenting a vocal tenderness unique to the rest of the album. That being said, the crux of Darcy’s vocal resonance shines through on tracks where he evokes the voice of Tim Buckley. 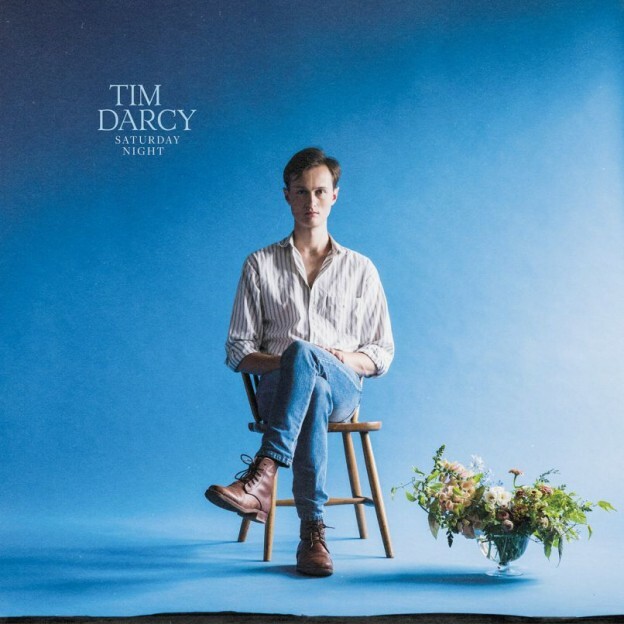 Though done in an eerier vein, Darcy successfully harnesses Buckley’s beguiling vocal richness, highlighting his ability to transform the quintessential Americana voice into something simultaneously sweet and haunting. With the track “Found My Limit,” Saturday Night’s themes of rustic Americana converge with more uncanny lyrical content. Darcy’s wistful vocals, intertwined with the subtle plucking of a guitar, foster an almost Lynchian atmosphere. On the album’s title track, Darcy’s ghostly vocals are webbed into a volatile instrumental: the twangs and screeches of the song’s wavering instrumental echoes the experimentalism of White Light/White Heat-era Velvet Underground. Meanwhile, with “Saint Germain,” Darcy’s voice maintains a trance-like calmness that cuts through the instrumental clamor and perpetuates the album’s overall unearthly feeling. Ultimately, Darcy’s solo project is wildly imaginative. Darcy takes an element of fanciful bizarreness and imbues it with a rural spirit, fusing more traditional Americana with elements of the avant-garde. At times, Darcy’s attempt to cover so much ground in one album may lead to it being slightly convoluted; however, Saturday Night ultimately succeeds as a wholly enthralling listen. This entry was posted in Reviews and tagged Bar Le Ritz PDB, Saturday Night, Soraya Mamiche Afara, Tim Darcy on March 3, 2017 by CKUT Music Coordinator. Concert Review: Cate Le Bon @ Le Ritz P.D.B. 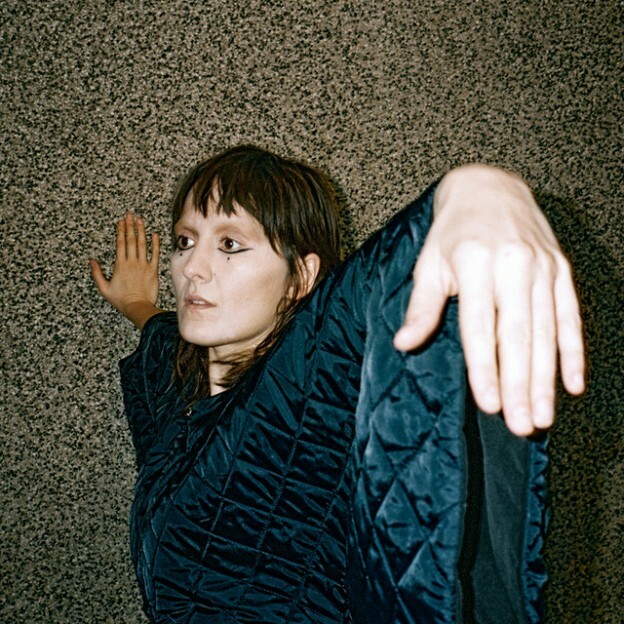 Hurrying into the dimly lit venue, I yanked my gloves off and prepared my wrist for the stamp of the week – tonight Cate Le Bon was playing at Bar Le Ritz. Stamped and ready to go, I squeezed through slivers of space amongst the crowd and made my way to the middle of the venue. Tim Presley’s set was over, and murmurs engulfed the room. However, once the back door began to creak open, a hush fell over the audience. Within seconds, Le Bon and her band, clad in black, appeared and swiftly made their way to the center of the stage. Le Bon then leaned into the mic and announced that Tim Presley would be joining them on drums. The original drummer was, unfortunately, unable to perform due to immigration issues. Nonetheless, with that, Presley, garbed and face-painted in bright white, made his way to the drums. Though divergent in terms of dress, Le Bon and her band, including Presley, were determined to beguile the crowd. Amongst the variety of songs played throughout the night, the tracks off of Crab Day (Le Bon’s most recent LP) could be identified by their shrill twang harkening back to late ‘60s rock. Opening with “Crab Day,” the band shattered the silenced room with an electrifying guitar intro. A voltaic beat was set free, and the crowd succumbed immediately. Other Crab Day gems followed: with “Wonderful,” Le Bon and her band fused a distinct Kinks influence with the eccentricity of Roxy Music. This bizarre concoction left the crowd both enthralled and energized. With “Love Is Not Love,” the emphasis switched from instrumental to vocals. Le Bon’s sweet yet haunting voice seeped to every corner of the room, charming listeners on its way. If the tracks off of Crab Day were bound by hints of the Kinks, then the tracks off of Rock Pool (Le Bon’s most recent EP) are welded by elements of the Velvet Underground and Nico. “Aside From Growing Old,” arguably my favorite track of the night, paired melancholic lyrics with an energized tune. At first, Le Bon’s soft and somewhat ghostly vocals, bearing traces of Nico, gently beckoned the audience; however, within moments, the tender melody shed its skin and unleashed Le Bon howling the ever-so relatable lines “What’s the problem, I’m losing my mind.” Moreover, with “I Just Wanna Be Good,” Le Bon’s heartfelt lyrics were at their peak. As the show progressed it became clear to me that the crux of Le Bon’s vocal allure is rooted in the genuine sentiment that comes through when she sings. Nevertheless, the show’s inevitable end was fast approaching. Le Bon’s farewell – a soft-spoken “merci beaucoup” – was met by the howls of a happy crowd. Through her wistful and zany ways, Le Bon captivated her audience and once again, Bar Le Ritz hosted a lovely refuge from a numbing Montreal winter’s night. This entry was posted in Reviews and tagged Bar Le Ritz PDB, cate le bon, Soraya Mamiche Afara, tim presley on February 17, 2017 by CKUT Music Coordinator. 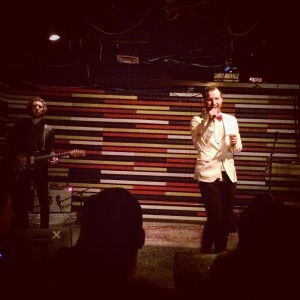 Chris Baio chose the coldest place to end his Northeast tour for his debut full-length album, The Names. As I’m sure anyone in Montreal who ventured out of their homes yesterday knows, the polar vortex hit the city with force. However, in the dimly lit Bar Le Ritz, summertime was imminent. Bouncing back and forth between his keyboard and center stage clad in a white suit jacket and a cheery red bowtie, Baio brought a refreshing vibe to the intimate space, accompanied by George Hume on the electric guitar. BAIO is a solo DJ project, with both instrumental dance tracks and indietronica numbers featuring Baio’s eclectic singing style. While some subtle elements in Baio’s work can be traced back to his involvement as Vampire Weekend’s bassist, he has done well in differentiating himself as an independent artist. The Names is an innovative and refreshing take on indie dance and electronica, and the inclusion of a live guitarist in concert further underlined this fact. Another unnamed track followed, which demonstrated his penchant for DJing. Hume’s guitar work was highlighted quite a bit in this performance, ripping out strong solos before the bass beat exploded about halfway through the track. The crowd, mostly swaying and bobbing, came to life at this as if by the flick of a switch, and Baio mirrored the change in pace, grinning and bopping up and down behind the keyboard. He transitioned right into the album’s hit single, “Sister of Pearl,” to cheers from the audience. In an interlude between “I Was Born in a Marathon,” Baio cheekily plugged merchandise and introduced Hume. He then played a few more tracks off The Names, covering The Eurythmics’ “Here Comes The Rain Again,” with and earsplitting bass and audience participation on the lyrics. Baio ended his hour-long set with “Scarlett,” the last song on The Names and a purely instrumental track with a pensive melody and expert layering. He said a small goodbye and thank you to the crowd and stepped off the stage, leaving Hume to wrap up the outro. The concert was short, intimate, and light; a perfect oasis in the wintry desert that Montreal has become. 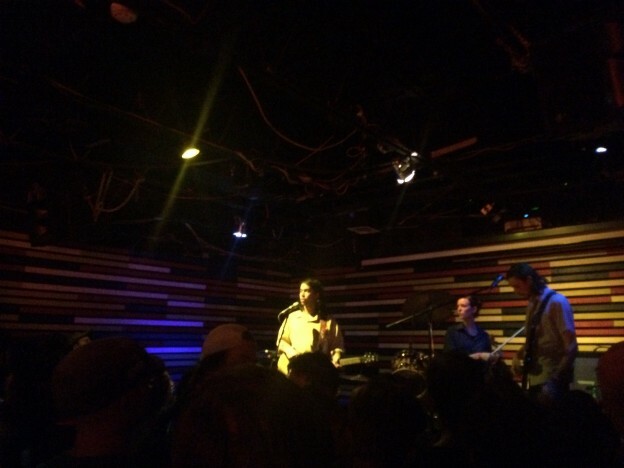 Baio was quite comfortable in the intimate setting, but his sound is really meant for a bigger crowd, one that has room to move and groove and shake their hips right along with him. His sound is honest and vibrant, with candid and clever lyrics: a welcome change in the IDM and electronica scene. Hopefully, BAIO will return to Montreal to bring some warmth and cheer in the near future. This entry was posted in Reviews and tagged BAIO, Bar Le Ritz PDB, concert review, CRi, Montreal, The Names on February 14, 2016 by Juliana Van Amsterdam.